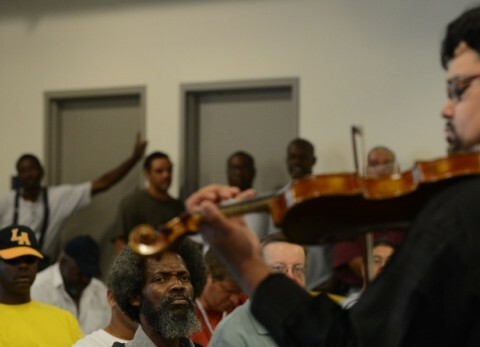 Schumann’s simple creed has become the mission of a group of local musicians and musical activists known as Street Symphony: the brainchild of LA Philharmonic violinist Vijay Gupta, who tells me it grew out of a relationship he had with Nathaniel Ayers—the Juilliard-trained musician, whose battles with schizophrenia had left him homeless, living on Skid Row. Ayers’ story was chronicled in columns in the LA Times by Steve Lopez, which became the book and eventually the movie, The Soloist. So, Vijay Gupta started gathering his colleagues in the LA Philharmonic and other LA-area musicians to go to Skid Row and perform. They played at several clinics and shelters, including the LA Department of Mental Health. But Gupta tells me the prospect of making music on Skid Row regularly, made him uncomfortable. VG: What did music mean to me? Why was it important to be making music? To be devoting my life to classical music? BL: That’s a very fundamental question, right? BL: Here you’ve made this career choice and you’ve devoted these many thousands of hours of practice room time, you’ve joined a world-class orchestra, playing with the greatest musicians in the world and yet, you’re having these questions: what does this all mean? Recently, Gupta and his colleagues with Street Symphony have focused their performing energies in a couple of places: performances in jails, and a partnership with PATH—People Assisting the Homeless. 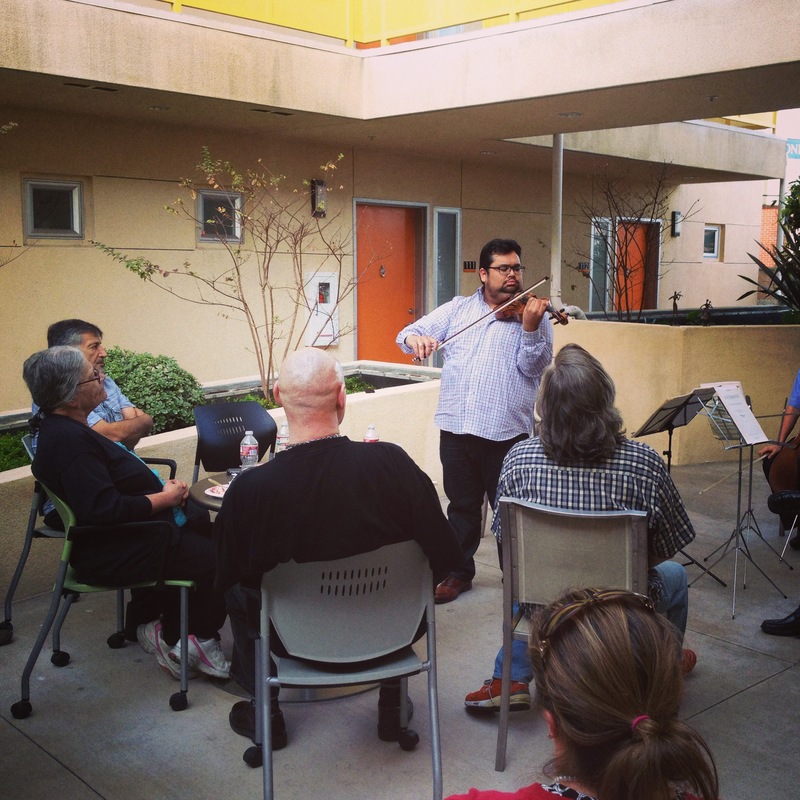 Not long ago, I attended a Street Symphony performance at a permanent supportive housing PATH facility for formerly homeless residents of Silver Lake. Gupta and two fellow members of the LA Phil performed trios by Beethoven and Dohnányi, and then Gupta took a solo turn, playing the Bach Chaconne from the d-minor Violin Partita. Following the performance, the floor was open for questions from the audience. BL: There was a guy who walked in halfway through the performance. He had been grocery shopping and he had his bags from Trader Joe’s and he took his groceries into his apartment and then he came back out and pulled up a chair as you guys were playing some Beethoven and just sat there, quietly. Then, in the question-and-answer session, at the very end, finally, he stands up and he says, “Of all of the apartment buildings in Los Angeles, why are you here? Why are you at this one?” What did you think in that moment? What is this gentleman really asking me? What crossed your mind as he asked that question? VG: In a way, it’s a bit overwhelming. The first thing that comes to my mind is, is he asking, “Are we worth this music? Are we worth your presence?” And I think I answered by saying, “We’re here because we don’t come here. We’re here because we don’t know you. And that’s not a good enough answer.” But I think that the key factor here is acknowledgement. Human acknowledgement. And the fact that you showed up and that you are there to acknowledge the personhood of any person through this act of offering music is the goal. In a way, we’re creating safe spaces. We’re creating deeply vulnerable spaces where we’re allowed to feel. I think, because of places like Skid Row or because of conditions like homelessness or incarceration, we lose words and we look the other way. And that’s not good enough. Losing words doesn’t mean that we lose voice. And this music gives us voice. BL: This is activism, isn’t it? This is activism defined. This is music being more than just notes and emotions and feelings. VG: Well, I think music is more than notes and emotions and feelings. A couple of months into Street Symphony, I thought, “This is musical activism: we’re musical humanitarians and we’re bringing music into places that would never have access to people like us and music like us.” And then, I started to have a different perspective and I think it’s a much more real one. It’s the sense that, yes, these people would never have access to us, but in a way, because of our own crafting, we don’t have access to them. And we’ve seen the doors of the jail open up for us simply because we were carrying instruments. And we’ve seen our filters of how we perceive homelessness and mental health and people who live in organizations like The Midnight Mission, we’ve seen that filter dissembled. And I feel like that is activism worked upon us through music. VG: That’s very true. That’s very, very true. I think that’s why the concerts have as much of an effect on our audience as they do on us. Of course, it has a lot to do with music, but often times it’s simply because we were there. And we got to interact with people who crave interaction, who have forgotten what it’s like to feel human. And there’s always more. There’s always more places, there’s always more music, and there’s always more to say. And I think that we’re just beginning the conversation. Vijay Gupta is the founder and artistic director of Street Symphony. He’s also a first violinist in the LA Philharmonic, a TED Senior Fellow, and the chief curator of TEDxSkidRow. An audio version of this story appeared on KUSC’s Arts Alive, 3/8/2014.